Recently I had the opportunity to work with Storybuilders on a book review. Well actually all I did was volunteer Emily to do it. She did all the hard work. "Spies Inc. begins with The Adventures of Dash Danger, the favorite book of a fifth-grade boy. 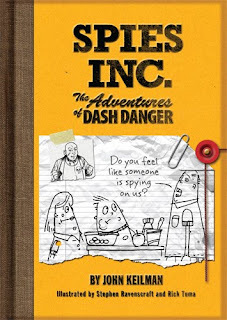 After bully Biff Vermin sends him on a mission to steal a secret cupcake frosting recipe from The Lunch Lady, the boy looks for help inside his Dash Danger book. But he needs your help, too, to pull this off. You get to create a cool spy name, map out a plan, design gadgets and develop a secret code. Sharp, clever writing courtesy of Chicago Tribune reporter John Keilman, and hilarious illustrations provided by Stephen Ravenscraft and Rick Tuma who promise you’ll never look at a cupcake the same way again." Emily thoroughly enjoyed this book. I have been on her all summer about reading. I have taken her to the library several times only for her to return books that were never opened. This book however was devoured in only a few days. She was so exited before she even received it. The back was personalized with things from her life and her picture, which she thought was the coolest! She also liked that in between chapters there were activities to do. She can not wait for the next book to be published! I would recommend this book to any one with tween kiddos, boys or girls! Personalizing a story makes it come alive for a child as Emily's enthusiastic response to Storybuilders indicates!